Bonnie Lass: What's this all about?! “Bonnie Lass: The Legend” spins the yarn of a brash and daring young heroine and her two muscle-headed sidekicks as they set out to build a reputation as swashbuckling adventurers to be envied and lauded. Bent on overshadowing her father, the infamous Cutlass, Bonnie’s after the one treasure he did not claim — the Eye of the Leviathan. But there are other forces at work seeking to claim it for themselves. Bonnie’s world blends the familiar cultural motifs of the most legendary sea-faring pirates of the 1700s and 1800s with the tone of an American western and a dash of modern-day technology like automobiles and GPS. The unique setting lends unexpected and wildly entertaining twists to a traditional pirate tale. “Bonnie Lass: The Legend” is available for purchase on the comixology (https://comics.comixology.com/#/series/5548/ — iOS, web and Android) and iVerse (http://www.iversecomics.com – iOS, PSP) digital platforms. Issue #1 is a plus-sized 34 pages long for just $1.99! “Bonnie Lass” was produced by two decently- to well-groomed gentlemen—created, written and illustrated by Michael Mayne and co-written by Tyler Fluharty. Michael is a freelance illustrator and graphic designer from the sticks of Kentucky, with over twenty-five small press children’s books and novel covers to his credit. He recently illustrated the “VSS vs. Gearz” one-shot comic from Bluewater Productions and is in the midst of other comic projects at the moment. In his free time, Michael enjoys an entertaining movie, going to karaoke, and wishing he had more free time. Tyler is a 3D Artist out of Cincinnati, Ohio who attended Shawnee State University 04-08, and since then has done various freelance projects including a year long job through Smashball Labs for their Steam Release "SMASHBALL". He's currently teaching as an adjunct Professor at Shawnee State University while doing freelance work. He is also a big fan of Bill Murray and John Candy movies. 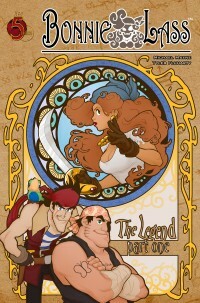 Bonnie Lass: The Legend (print) Find all four issues of The Legend at your local comic shop! If they don't have it, ask them to order it! Content ©2008 Michael Mayne. Characters and logo are ™ properties of Michael Mayne. Awesome Inc. theme. Powered by Blogger.